We believe that, for the foreseeable future, the most powerful contrast between progressives and conservatives is and will be economic fairness. Progressives side with the middle class while conservatives side with the rich. Donald Trump turned this contrast on its head, using a conservative economic message and amplifying negative attitudes about people of color to convince non-college educated White voters that conservatives side with the middle class while progressives side only with people of color. We can take back the economic narrative in a way that clearly articulates that no one needs to be left behind, and we must. President John F. Kennedy repeatedly used the aphorism “a rising tide lifts all boats,” and it came to mean that a stronger economy benefits all Americans. At that time, Kennedy was correct. 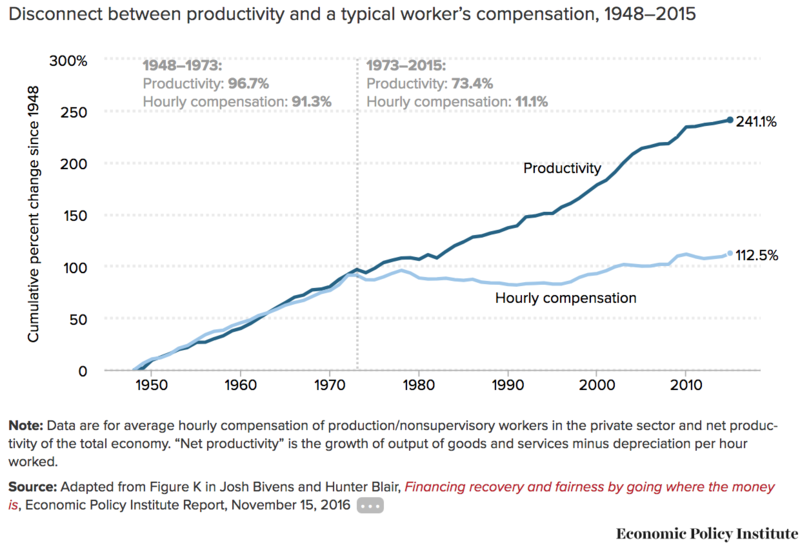 As demonstrated by the chart below, the benefits of increased productivity—that is, the creation of wealth across the U.S. economy—were fairly distributed to average workers from the post-war period into the Nixon Administration. 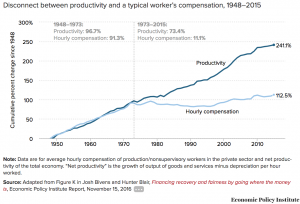 But starting in the 1970s and greatly accelerating during the Reagan Administration, real compensation (that is, wages and benefits, adjusted for inflation) stopped rising. While the economy continued to grow at a rapid pace, typical workers no longer received a reasonable share of the wealth they helped to create. Instead, nearly all of that money was, and still is, diverted to the most affluent. This can also be seen another way. 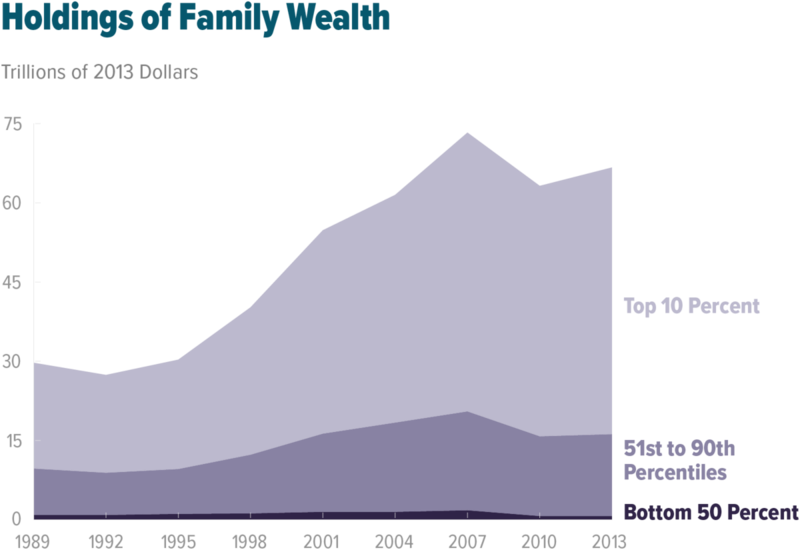 The chart below demonstrates that since the end of the Reagan Administration, the richest 10 percent of Americans doubled their wealth while the bottom 90 percent gained only slightly, and the bottom half—which own just one percent of all the nation’s assets—gained nothing. Today, the richest one percent of Americans own more private wealth than the bottom 95 percent combined. The 20 wealthiest Americans own more assets than the entire bottom half of the U.S. population. And just eight people—six of them Americans Bill Gates, Warren Buffett, Jeff Bezos, Mark Zuckerberg, Larry Ellison and Michael Bloomberg—own as much wealth as half of the world’s population (that is, 3.6 billion people) combined. While conservatives assert it was just normal functioning of “the market,” the redirection of wealth to the wealthy was consciously accomplished in myriad ways, large and small. Management pay was exponentially increased, workers’ benefits were minimized, key government regulations were amended or abolished, taxes were evaded, unions were destroyed, corporations sent factory jobs overseas, businesses cut costs by minimizing customer service and instead making their customers do part of the work, and most recently, Wall Street embraced money-making schemes that were little more than scams. The wealth that all Americans created together didn’t just passively flow to the rich, they actively took it for themselves. If this sounds to you like a harsh assessment, we urge you to read about it yourself. It is essential to understand what underlies the populist uprising that fueled both the Trump and Sanders campaigns in 2016. Without knowing any of the details of these charts and statistics, typical American workers feel that they have been treated unfairly, that their families are worse off than they were some decades ago, and somebody is to blame for it. And, in that at least, they are right. Obviously the right-wing media, owned by and operated for the rich, are not going to talk about this concentration of wealth. But neither will the mainstream media. Thus, the economic truth is both unseen and unheard—it remains hidden in plain sight—and, as such, it can trigger some Americans to blame people of color, immigrants, low income workers, and others, rather than the real culprits.